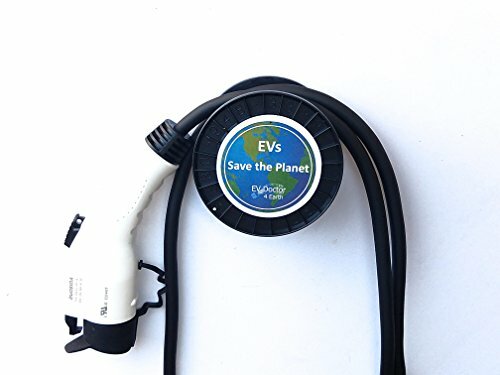 EVDoctor The 1 Original EV-Cable-Hanger protects the cable and J1772 handle of Level 1 and Level 2 Electric Vehicle Car Chargers (EVSE). Bonus items: Rain Bonnet and EVs Save the Planet Sticker by EVDoctor at Lazaranda Dallas. MPN: EV-CABLE-HANGER. Hurry! Limited time offer. Offer valid only while supplies last. PROTECT YOUR INVESTMENT - Organize your cables and connectors. Keep cables off the floor and prevent them from twisting. Prevent damage to your J1772 handle from dropping or being run over. We repair chargers and these are the #1 problems. SATISFACTION GUARANTEED. We offer a no questions asked return policy and an industry leading enhanced 3 year* warranty (*registration required) . Our standard accessory and adapter warranty is 3 months. REPURPOSED, HEAVY DUTY, DURABLE - Show your EV Pride. Helps the environment by not creating yet another product. Heavy duty plastic spool, originally used to store heavy electric wire. The 5" diameter is gentle on your cables No sharp edges like some 'hooks'. EASY TO INSTALL - Mount to wall board or a wall stud. Screws and anchors are provided. A drill and screwdriver are required. Attach the 'EVs Save the Planet' sticker if desired. EVDoctor EXCLUSIVE BONUS ITEMS - This order includes: an EV Rain Bonnet (give one to a friend that charges outdoors) and an "EV's Save The Planet' sticker (Display it with EV Pride). If you have any questions about this product by EVDoctor, contact us by completing and submitting the form below. If you are looking for a specif part number, please include it with your message.